What I wore to the David Yurman at Lux Bond & Green event two weeks ago. A special thanks to Smita for taking these pictures. It was my first time braving a social event alone! Without a friend to help snap photos of my outfit, she came to my rescue. Excuse my infrequent updates, I'm still on vacation mode and I can't seem to snap out of it! Your DIY Elizabeth & James blazer is seriously amazing, Khatu. So in awe of your DIY talent! i cant believe you DIYed that! What a pretty outfit...love the white on white and those shoes! I am drooling over this dress! I have been on the hunt for the perfect white dress and I think you've found it! So gorgeous! I absolutely love your rendition of the E&J blazer! You look stunning as always! OMG, I'm obsessed with this outfit! It's so super chic! Love what you did with the blazer! You are such an amazing DIY-er! I hope I can one day be as brave as you and wear an all-white outfit, haha. Impressive! That DIY blazer is simply stunning. you go girl!! sorry i couldn't make that one! hope it was better than tiffany's!!! Stunning! I love the DIY blazer! OMG this is gorgeous. 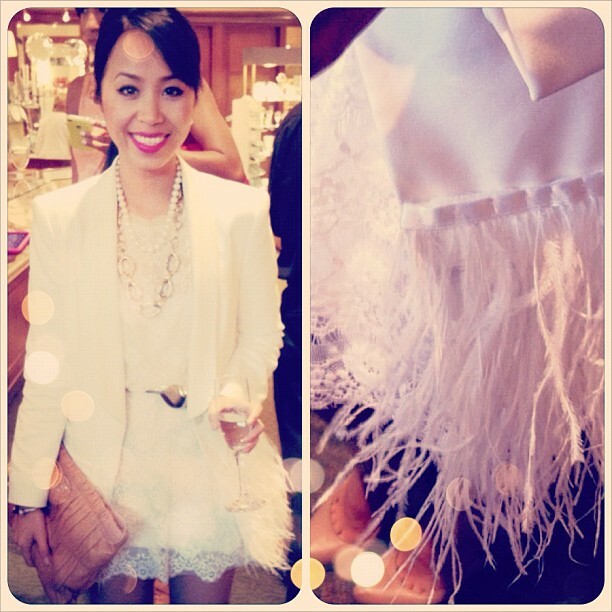 I love the all white ensemble and the feathers makes the outfit. That's a DIY? Please post a tutorial, it's fabulous! How do you find out about the fashion events in boston? i'd like to be up to date too. Too pretty -- you did a fabulous job! ummm, YOU ARE BRILLIANT! Tutorial please! You look darling as always! I was sorry to miss the event. I had planned to go but couldn't end up pulling it off. Looks like it was great fun! Speechless..... Stunning and the outfit is right for the money ! I miss out of this dress and sold out by the time i over it. Hopefully it will comeback. Please post a tutorial on this DIY project and mind if I ask, where did you get the feathers? Wish I could pull something off like this. :) I just don't think there's a style window for it in Honolulu, though. No one dresses up here.